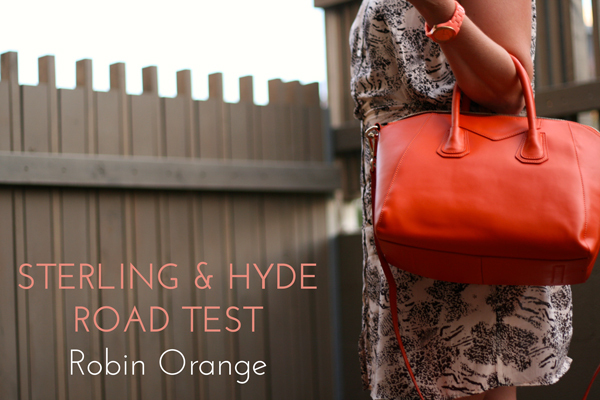 I love a good handbag and when Sterling & Hyde put the shout out on Facebook a month or so ago for road testers I put my hands up!! We were offered a 50% discount for our honest review. I posted about Sterling & Hyde some time ago on their custom made bag service and love the look of their bags. Now was my chance to have my own Out of the bags that were up for road testing I went for BIG and BOLD! So I chose the Robin Orange. 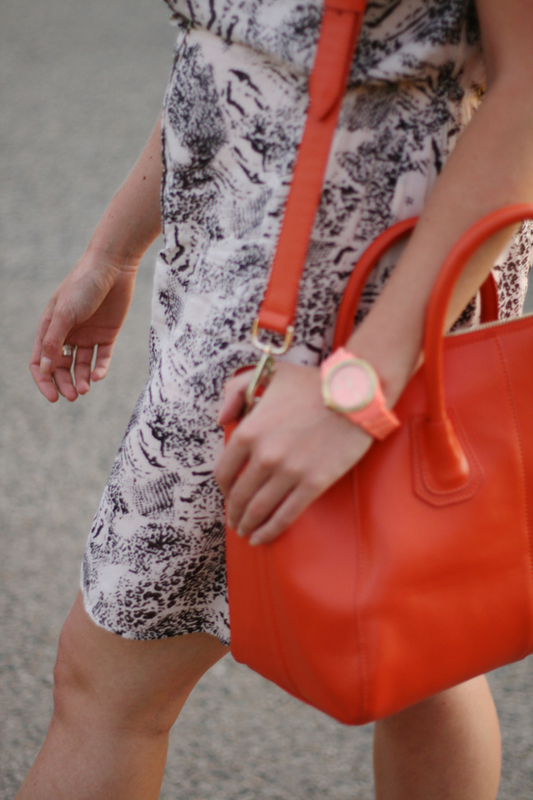 The Robin is the perfect bag for work. It fits all my geeky necessities. My DSLR, phone, iPad, notebook, make up etc. I saves me from taking/lugging another bag with bits and bobs in it. The other plus is when I don't have too much to carry this baby still keeps it shape. There is nothing worse than a limp and lifeless bag! A detachable shoulder strap is great so you can have both hands free to drink coffee on the run or shop like a superstar. The bag retails for $269.95 and is made from Nappa Leather and has a light coloured lining so it is easy to find what you are looking for. Sterling & Hyde offer free shipping with all there orders. If you are not wanting a bold blast of orange the Robin also comes in a classic black colourway. Me with my Robin from Sterling & Hyde | Sunnies - Jimmy Choo | Dress Magali Pascal - Bali | Wedges Tony Bianco. Sterling & Hyde also have a pop up warehouse sale in Melbourne next week if you would like to pick up a bargain or get in early for some Christmas presents. I love the Robin bag. It looks great and really bold in orange. Thanks for the tip on the sale, I think I need to make a trip to Melbourne this weekend.